Angelo Mazzoldi (1799-1864) was born in Montichiari, near Brescia in northern Italy. He studied law and also wrote on historical subjects. 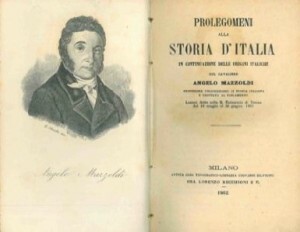 His best known was published in Milan in 1840 with the snappy title of Delle origini italiche e della diffusione dell’incivilimento italiano all’Egitto, alla Fenicia, alla Grecia ea tutte le nazioni asiatiche poste sul Mediterraneo (Of the Italic origin and spread of civilization Italian Egypt, Phoenicia, Greece and all Asian nations located on the Mediterranean)(a) . This provoked a critical response from the journalist Aurelio Bianchi-Giovini (1799-1862) and a debate ensued over the following two years (c). Emiliana Pasca Noether in her Roots of Italian Nationalism 1700-1815, recounts how Mazzoldi claimed that before Etruria, Italy had been home to Atlantis and dated its demise to 1986 BC and is recalled locally as the destruction of Tirrenide. Similarly, Pierre Vidal-Naquet described Mazzoldi as having “carved out a place for Atlantis in the Italians’ own history”. Mazzoldi expressed a form of regional hyperdiffusion that had his Italian Atlantis as the mother-culture which seeded all the great civilisations of the eastern Mediterranean region. Some of Mazzoldi’s views on ancient Italy were expanded on by later scholars such Camillo Ravioli, Ciro Nispi-Landi, Evelino Leonardi, Constantine Cattoi, Guido DiNardo and Giuseppe Brex (b).